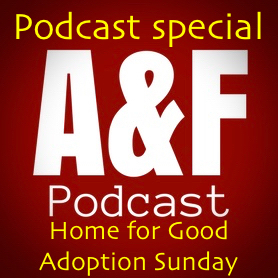 On this special episode Al talks to Phil Green from Home for Good about the work that they do in the UK with local churches supporting and promoting adoption and fostering. It's Adoption Sunday on the 5th November and many UK churches will be highlighting the work that many families and individuals do to support some of the most vulnerable children in our society. Of course it may not be your cup of tea so feel free to skip it as the next podcast episode is due on Saturday the 4th. We discuss a range of issues including the challenges that many foster carers and adoters feel within church communities, motiviations to foster and adopt, social work perceptions, future plans and lots of other stuff. As always your comments and thoughts are welcome.